I’m back to ‘critter wine’ tonight and one I can heartily recommend if you can find it. Dancing Coyote Winery does several non-traditional white grapes for California including Chenin Blanc, Grunter Veltliner, Verdelho, and the one I opened today – Albarino. Anyone who has read this blog knows I’m a fan of Spain and Portugal’s clean and crisp Albarino. So I didn’t know what to expect when I finally got around to opening this one today. It is very, very hot and humid in Indiana today. As a matter of fact as I write this entry at 4:45, it’s 92 degrees with a heat index over 100! I wanted something light and crisp after some yard work and a shower. I opened the Dancing Coyote Albarino and it’s perfect for a hot day! This is a clean and crisp wine with a pronounced tartness I really like. It has an aromatic nose and gives you a mouthful of citrus and honey, then some tartness and acidity. And at 13 percent alcohol it’s not going to be too heavy for a warm day. Dancing Coyote is located in Clarksburg, CA., and it produced just 1,500 cases of this unoaked wine. I’ve tasted a lot of Albarino in the past year, all from Europe, and this one holds up as a refreshing alternative to any of the Spanish and Portuguese versions I’ve tasted. 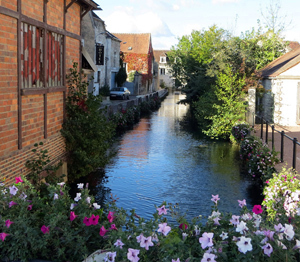 I get excited to taste these interesting and non-traditional wines. Well, at least non-traditional geographically. I’m not the only one who liked the critter wine either. 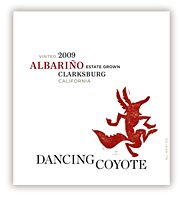 Wine Enthusiast gave Coyote’s Albarino a solid 87 and Best Buy categorization.